We can’t manage what we can’t measure. This is a repeated mantra across sustainability efforts. While measurement can prove to be difficult for some areas, our energy consumption as a campus is something we can attempt to quantify. By conducting our greenhouse gas inventory on a regular basis, UWM can monitor its carbon footprint. Clean Air, Cool Planet’s calculator, is the standard across the nation for campuses to measure their greenhouse gas inventory. It includes the greenhouse gases specified by the Kyoto Protocol (CO2, CH4, N2O, HFC and PFC, and SF6), and delineates them under three scopes. These scopes take into account emissions generated on campus, purchased electricity, commuter and air travel, solid waste generated, refrigerants, and agriculture, while also including offsets like renewable energy, composting, and forest preservation. 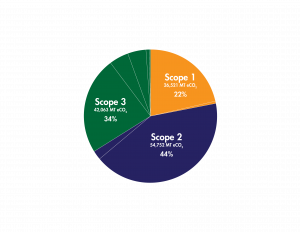 Scope 1 – includes all direct sources of GHG emissions from sources that are owned or controlled by the institution, including (but not limited to): production of electricity, heat, or steam; transportation or materials, products, waste, and community members; and fugitive emissions (from unintentional leaks). Scope 2 – includes GHG emissions from imports of electricity, heat or steam – generally those associated with the generation of imported sources of energy. Scope 3 – includes all other indirect sources of GHG emissions that may result from the activities of the institution but occur from sources owned or controlled by another company, such as: business travel, outsourced activities and contracts, emissions from waste generated by the institution when the GHG emissions occur at a facility controlled by another company, e.g. methane emissions from landfilled waste, and the commuting habits of community members. Scope 3 emissions are often the most difficult to measure on a campus. Every campus has its unique factors that are highlighted by going through this process. Accurate reporting is also based on what data is available. At UWM we generate our heating and cooling on site by a central plant and purchase electricity from our utility, WE Energies. We do have a campus fleet, as well as refrigerant generation, but no farms that generate animal waste and the greenhouse gas methane (CH4). Although, our solid waste generation is a contributor to methane, generated at the landfill we send it to. Not all campuses attempt to include commuter travel. This is sometimes difficult information to recover. 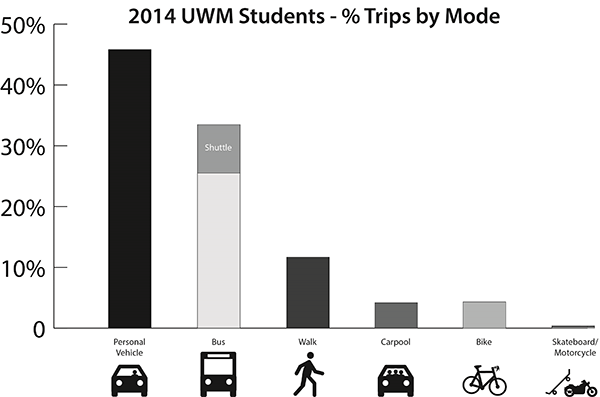 Here at UWM a transportation survey was conducted in the fall of 2008, 2012, and 2014 in order to gather a baseline for commutes to the Kenwood campus or other outlying campus buildings. This transportation survey was conducted for the greenhouse gas inventory while also supporting research in UWM’s School of Urban Planning.